The BPC Newsletter is looking for writers! 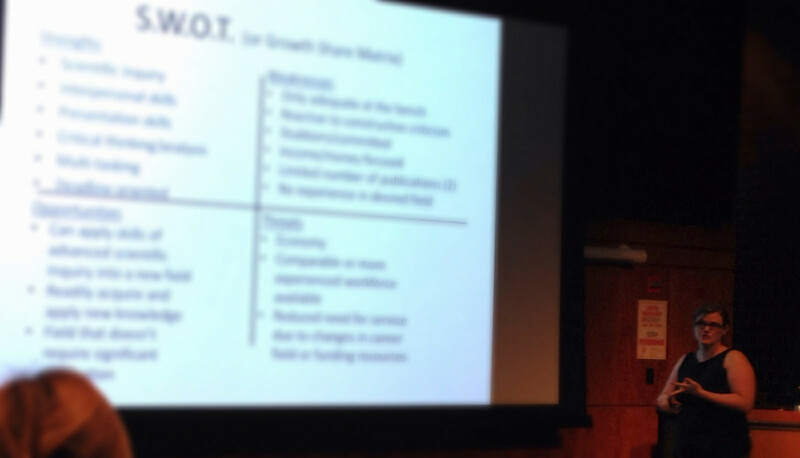 We cover both Penn BPC events and broader issues relevant to postdocs in the biosciences. Writers have the flexibility to write on topics including scientific research, science policy, career issues, lifestyle, and more. Whether you have experience in science writing or would like to build new skills in this area, the BPC Newsletter provides opportunities to develop and refine technique in science writing. By Amy Ghiretti, Ph.D., Liisa Hantsoo, Ph.D., and Simone Temporal, Ph.D.
September 15 – 19 marked National Postdoc Appreciation Week (NPAW), now in its fifth year. NPAW was originally created by the National Postdoc Association (NPA), and is meant to raise awareness of postdocs and the work that they do in research labs across the United States. 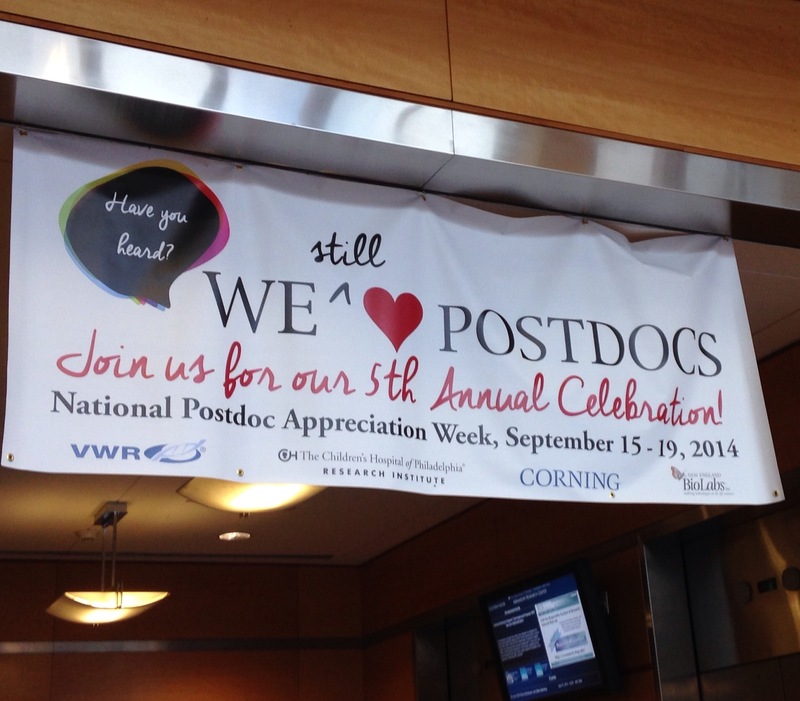 According to the NPA, last year 108 institutions in the U.S. and Canada officially celebrated NPAW, organizing events to recognize postdoctoral researchers (1) (http://www.nationalpostdoc.org/meetings-and-events-4/appreciation). The official NPA numbers are not yet in for this year’s events, but we caught up with Mary Anne Timmins from Penn’s Biomedical Postdoctoral Programs (BPP) and David Taylor of the Children’s Hospital of Philadelphia (CHOP) to get the inside details on this year’s NPAW at Penn. 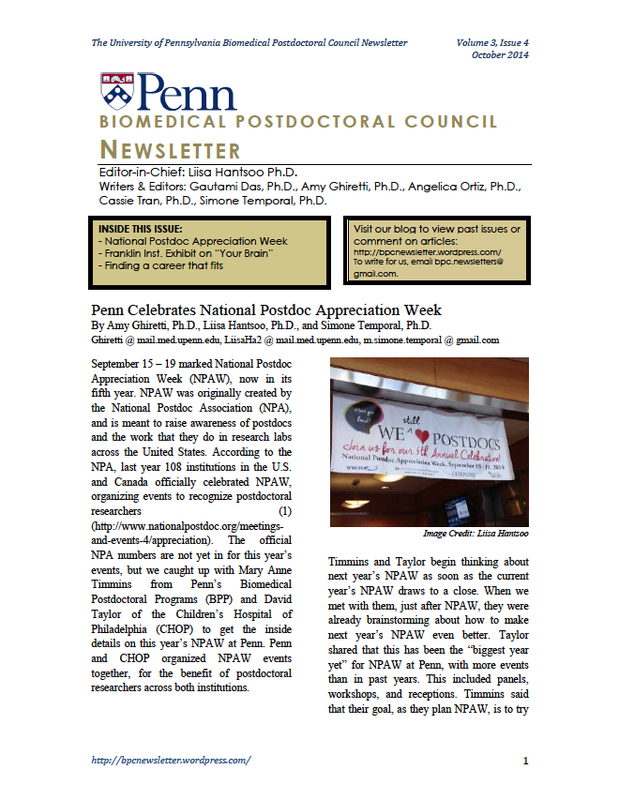 Penn and CHOP organized NPAW events together, for the benefit of postdoctoral researchers across both institutions. 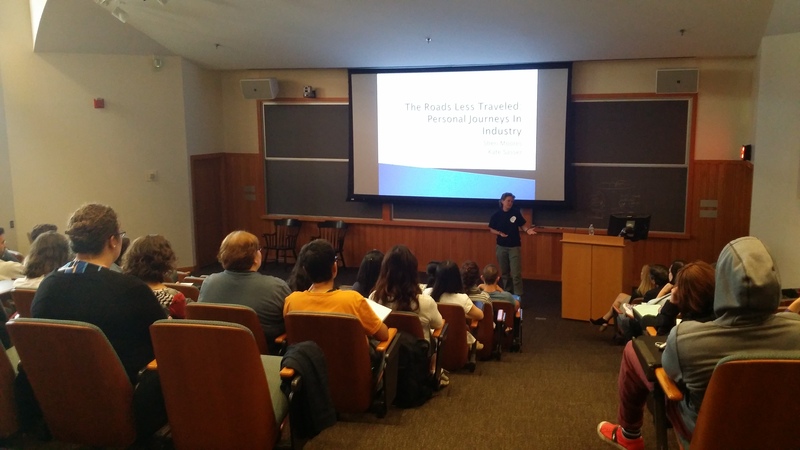 Dr. Burns, a Neuroscience PhD and registered patent agent with the Penn Center for Innovation, opened NPA Week with a talk that focused on shaping your own career. Burns emphasized 1) defining one’s values (salary, location, family time, passion for science, etc. ), 2) defining what success means to you (e.g. scientific recognition, social impact, clinical significance), 3) performing a SWOT (Strengths, Weaknesses, Opportunities, Threats) analysis to identify your strengths and weaknesses, 4) preliminary job searches to identify skills you lack for the position you want, 5) identifying exit strategies in case your planned career does not pan out, and 6) exploring career options with informational interviews, mentors, or conferences. Her recommendation is to have not one, but two “exit strategies” in case your primary career objective does not work out. She emphasized the importance of reviewing one’s skills in light of all three career options, and taking the time now (before actually beginning a job search) to seek out opportunities to fill in any gaps in your experience. This panel provided building blocks for searching for industry jobs, starting with an understanding of the different types of industry jobs that are out there (e.g. big pharma, small startups, patent firms, or consulting firms, to name a few). According to the panelists it is important that one fits a job description not only from a scientific perspective (i.e. do you know the science they want you to know? ), but from a business/social perspective as well (i.e. can you lead a group, or work independently as needed?). The panelists emphasized that success in industry is a combination of one’s scientific, business, and social identity. Speaker: Sheri Moores, Ph.D., Kate Sasser, Ph.D. This panel included scientists from Johnson & Johnson, who outlined their career paths and described their current positions. Dr. Sheri Moores works in drug discovery, the first step of the clinical process, at Johnson & Johnson. Moores wears three hats in her job at Johnson & Johnson – a program leader, a people manager, and a scientist, so her job is ideal for those who like to have different responsibilities and do something different each day. One of her main responsibilities is to identify what is called the “critical path”- the experiments that need to be performed to progress a project from discovery to clinical trials, get the resources to stay on that path, be an expert on all the data that is synthesized, and supervise/review the work of others. Originally interested in anthropology, Moores became interested in biology in college, went on to grad school, got her PhD, and then did a postdoc. She expressed that networking is key to building connections in industry and this can be critical when applying for jobs. Dr. Kate Sasser works in the translational group, bridging drug discovery and clinical trials. She came to the job via a clinical path; left to choose between a traditional postdoc and a consulting position with a large company, Sasser took the consulting job and has progressed from there. Moores and Sasser shared these personal stories, then compared academia and industry. In brief, many of the same principles apply to both academia and industry, so the panelists emphasized that you should never feel like you’re limited to one or the other. One of the more popular NPAW events, postdocs consumed six gallons of ice cream and six pounds of toppings! This event focused on practicing communication in a practical, in-the-moment way, giving participants immediate practice and feedback. The goal was to build skills in communication, not just about science, but beyond. It also served as a preview of future small-group, more intensive workshops that Mallory Fix may do at Penn in the future. BPC Social Committee Co-Chair Ana Misic, Ph.D. said that around 90 postdocs attended the happy hour, hosted in the top floor of BRB and overlooking the city. The event included beer, snacks, and a chance for postdocs to unwind after a busy week. The Franklin Institute Science Museum1 opened its newest permanent exhibit on June 14th and it has since proven to be a fun and educational experience for visitors of all ages. “Your Brain” takes museum guests on a journey through the world of neuroscience, featuring plenty of interactive and informative opportunities to learn all about the organ that makes us who we are: the brain. 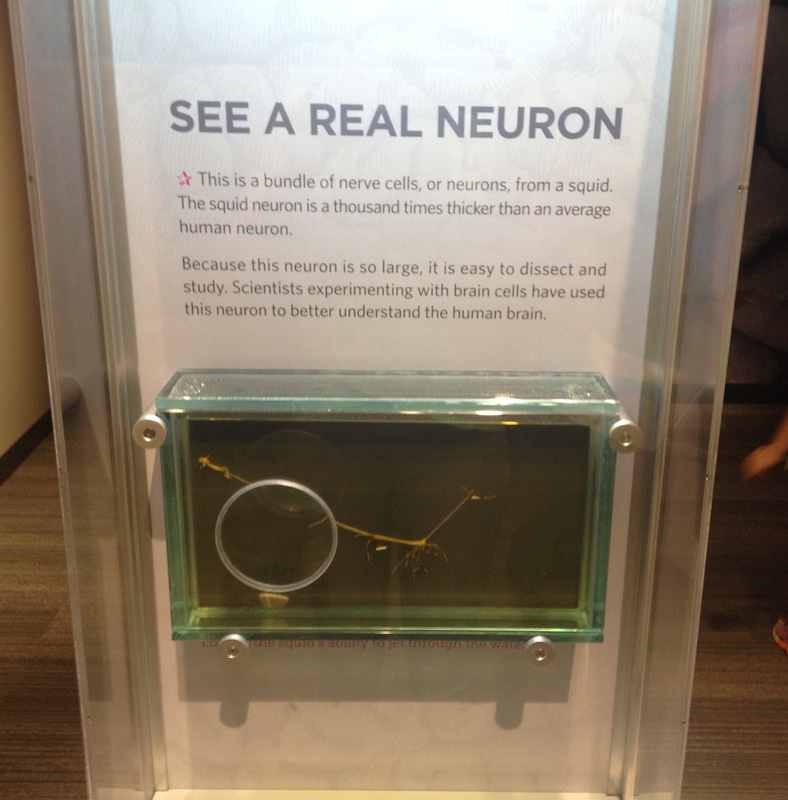 As a neuroscientist by training, I was excited to see the museum’s take on the field, and was not disappointed by my visit. 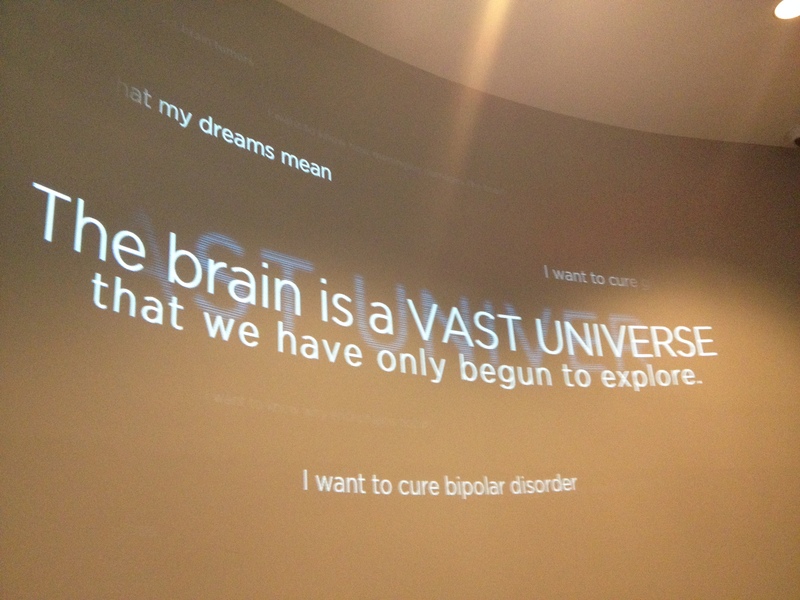 The exhibit consists of a series of rooms dedicated to different aspects of the nervous system. The tour begins with a description of gross brain anatomy, including descriptions of major brain regions including the cortex and cerebellum. Along with various models and pictures of the brain, an interactive sample MRI gives visitors a chance to see and control a real brain scan. Before moving to the next room, neuroscientists in particular should check out the real squid giant neuron on display, which they will recognize from the seminal work of Hodgkin and Huxley in mapping the action potential2. The next stop is purely for the kids, but still a lot of fun: a giant jungle gym designed to resemble a neural network. It’s a great place for the little ones to blow off some steam while sticking to the educational theme of the exhibit. 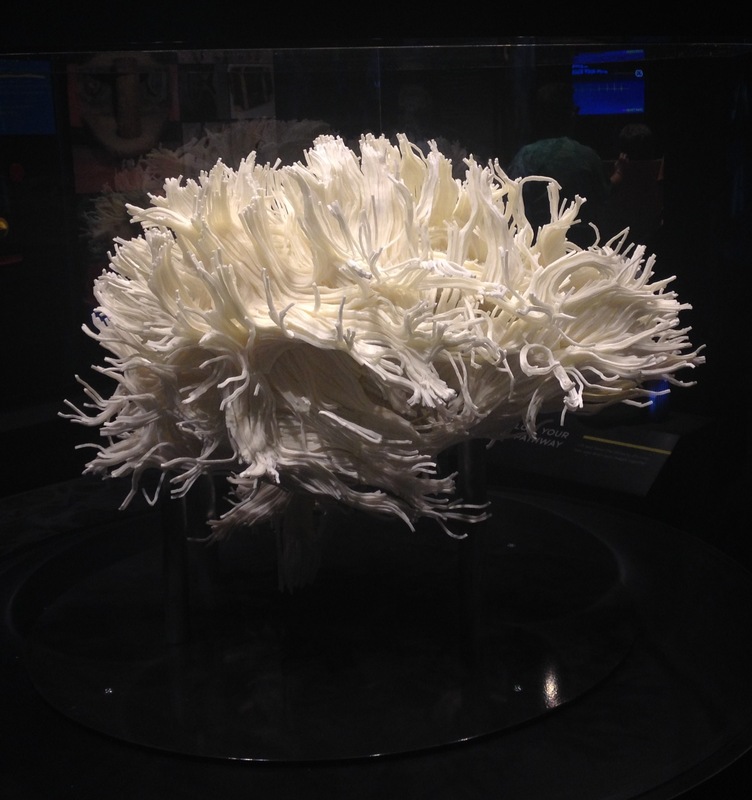 Subsequently, the exhibit zooms in on the structure of neurons, the individual cells that make up our brain. Sample activities include a model neuron that fires as a crank is turned, simulating the electrical threshold of an action potential, and a touchscreen where you can create your own neural network by linking virtual neurons together. The kids seemed fascinated by the recurrent feedforward loop I created, as each firing of the network was accompanied by noise and a flashing light. I think their parents were less impressed. Of note is a wall of art in this room that, upon closer inspection, includes images from research labs from around the country. The CLARITY3 and Brainbow4 projects, newer techniques aimed at visualizing the intact brain more clearly, are prominently featured, as are as are examples of neuronal imaging from Philadelphia-area labs at Thomas Jefferson University and our own Centers for Brain Injury and Repair5 and Neurodegenerative Disease Research6. The final and largest part of the exhibit delves into sensory networks and provides a fascinating glimpse into the pathways in our brain that mediate vision, touch, fear, and more. Test your senses through a variety of brain teasers and check out the accompanying information to understand why you just succeeded (or failed!) in solving the puzzle. See what happens when you lose your senses of balance and perspective through optical illusion. Play a video game to test your hand-eye coordination. Finally, you’ll exit the exhibit through a room that asks you to consider the future of “your brain,” and ponders some of the exciting directions that neuroscientific research is headed. Overall, “Your Brain” is an entertaining learning experience for children and adults alike. 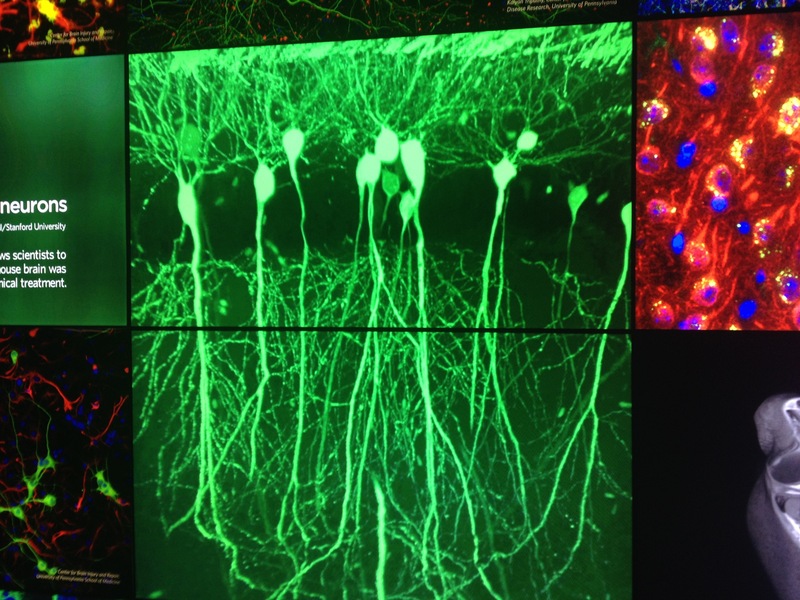 If you’re a neuroscientist by training like me, you’ll appreciate seeing the work of real research labs on display, and how the museum succeeds in presenting the sometimes-complex world of neuroscience to the general public. If you’re a harried postdoc parent looking for something different to entertain your kids on a weekend afternoon, this is a great option to get a little education in there too. Admission to the museum (which includes “Your Brain” and other permanent exhibits) is $18.50 for adults and $14.50 for children up to age 11. The more expensive daily pass ($26.50 for adults/$24.50 for children) includes the museum, planetarium, and an IMAX show. 2Hodgkin AL, Huxley AF. (1952). Currents carried by sodium and potassium ions through the membrane of the giant axon of Loligo. J Physiol 116(4): 449-472. 3Chung, K et al. (2013). Structural and molecular interrogation of intact biological systems. Nature 497(7449): 332-337. 4Livet J et al. (2007). Transgenic strategies for combinatorial expression of fluorescent proteins in the nervous system. Nature 450: 56–62. 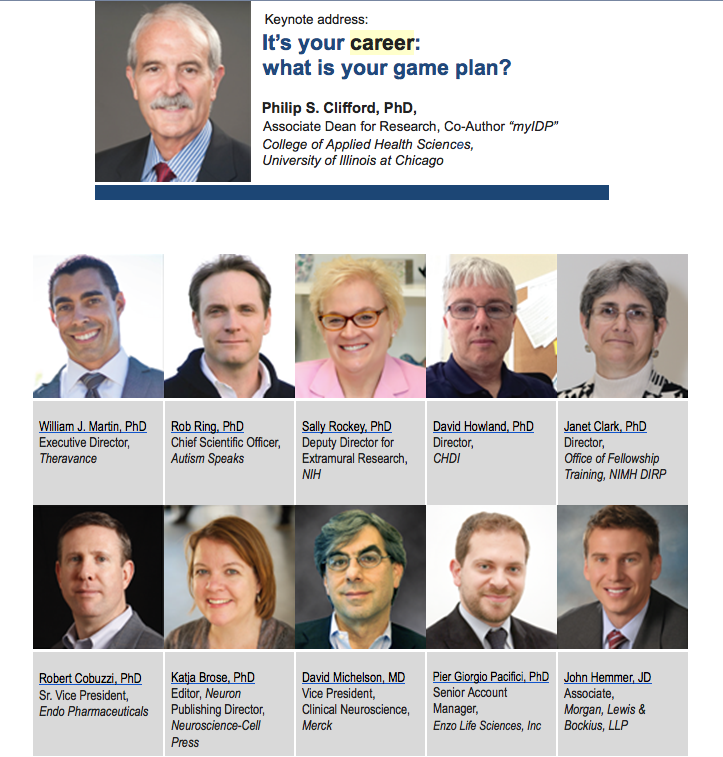 On September 5, 2014, Drexel University hosted their “Careers Beyond the Bench” Conference (http://www.drexelmed.edu/Home/AcademicPrograms/BiomedicalGraduateStudies/CareersBeyondtheBench.aspx). 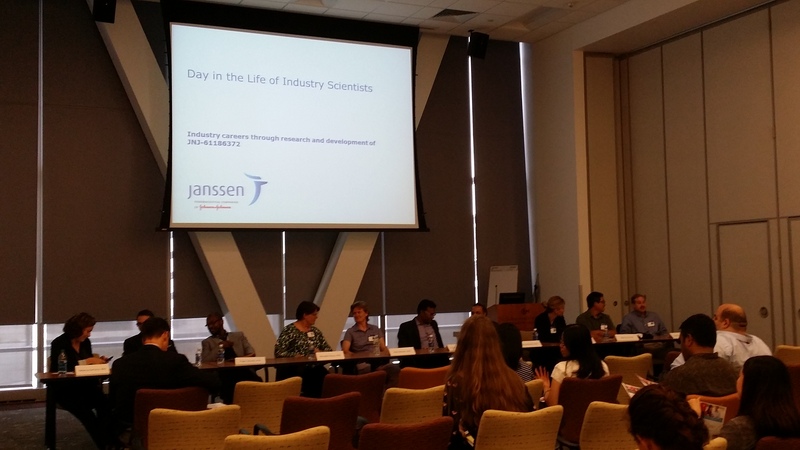 At this one-day event, invited speakers introduced a variety of potential opportunities for scientists interested in exploring careers outside academia. The first half of the day included speakers representing private industry, foundations/nonprofits and government agencies. Speakers shared their transition from academic research to these other sectors followed by a panel session. During the panel session, two other panelists joined the speakers. One belonged to a foundation and the other from the National Instutes of Health. During lunch, each table featured a speaker from the various job sectors introduced. The keynote speaker, Dr. Philip S. Clifford, who authored “myIDP” opened the second half of the conference and spoke about the bleak academic prospects facing scientists today. He encouraged the audience to take advantage of myIDP to determine their strengths and weaknesses and plan for an alternative career path outside academia. Three speakers from pharmaceuticals, science publications and clinical research followed. Each gave advice on how to transition into their particular field and answered more specific concerns of the audience during the panel discussion. In addition to the speakers, a lawyer and marketer joined the panel. Speakers from both sessions encouraged the audience to be open to unexpected opportunities. The event closed with a networking reception that gave attendees opportunities to speak to the speakers and panelists one-on-one. I love academic science research but I am not blinded by it. I am planning an alternative career path to follow since I accept that academic science research is a competitive field with many uncertainties. There are various job sectors to transition to that go beyond biopharmaceutical industry…but the transition is not simple. It is not enough to have a Ph.D. and/or postdoctoral experience. Gone are the days of single expertise. This is true within academia, true outside of it and even more true if you want to transition. When I was in graduate school, I often heard from various sources that other sectors are looking for people with Ph.Ds. It seemed like you can stumble on a job with your Ph.D. diploma in hand. It is not true. You need to have contacts and demonstrate more than the soft science skills developed from our academic science training. Out of the many speakers whom I listened to and met, only one took a direct path and transitioned from academia to industry. The caveat is she worked in industry before graduate school and her postdoctoral research project had translational aspects and ties to industry. Transition is not a hobby. Transitioning to another field is more akin to changing careers entirely requiring a great deal of time and effort. To understand the intricacies of this process, I went into researching and planning my potential transition, thinking that I can do it whenever I have spare time, after work and on the weekends. This method proved difficult because there is so much more that goes into transitioning – networking, building additional non- scientific skills, researching different positions and all the other things required simply to apply for available positions. I am weaving informational interviews, conferences, building my professional online and offline network, computer and professional classes between my academic responsibilities. I always thought that I had a prepared elevator speech until I attended all these events. Each situation called for a different version based on available time, conversation and audience. Although I have practiced by myself, there are only so many variables that one can account for. I now view networking events as opportunities to craft and refine my elevator speeches to various scenarios. Also, the more networking events I attend, the easier it has become to introduce myself to perfect strangers. Calling an event “networking” never eased the awkwardness I felt approaching people who I did not know. Job descriptions give an overview of a position, not the daily grind and environment. There are positions that I thought I would be perfect for me until I spoke to somebody with the position. These events, especially the networking session gave me an opportunity to find out more about a position beyond the advertised job descriptions. For discussion… Post your comments below! Have you recently attended an “alternative career” event or conference? What, if any, have you learned from attending conferences and networking events? What have you done to plan for an alternative career?